Depression is one of the most common — as well as most disabling disorders — affecting Americans.1 The World Health Organization estimates that depression affects more than 350 million people across the globe.6 Unfortunately, depression is often either over-treated, un-addressed or treated with medications which produce side effects or simply do not help. Historically, depression was viewed as an imbalance in neurotransmitters, specifically serotonin — a neurotransmitter that helps regulate many things, including mood, social behavior, appetite, digestion, sleep, memory, and sexual desire and function. It’s important to look at mental health from an individualized perspective, and realize that although you may have a certain mental health diagnosis, it is important to understand and address the contributing factors to you as an individual, because each person is different. Depression and other mood disorders are complex, with numerous factors, and should be approached as such. It’s also now being recognized as a much more complex issue, and highly affected by the immune system and inflammatory pathways. Both stressful events and everyday stress have been shown to activate these inflammatory pathways and result in depressive symptoms.4 Nutritional deficiencies, hormonal imbalances, genetics, as well as environmental and toxic exposures are also implicated in the development of mental health issues. Much of this comes down to how well we’re nourishing our bodies and our brains. The foods we eat — or do not eat — can impact our biochemistry, contributing to mental health disorders like depression. Ahead, find my breakdown of how you can use nutrition to impact your mental health. AGEs are formed by a reaction that occurs when cooking food, especially at high temperatures (searing, grilling, broiling, roasting, frying) and in those that are animal-based and contain high amounts of fat and protein. In addition, foods high in saturated fat create more inflammation in the body than foods that are higher in polyunsaturated fats, found in plants, no matter what temperature they’re cooked at.3,5 These foods are associated not only with depression, but also almost every chronic disease there is. 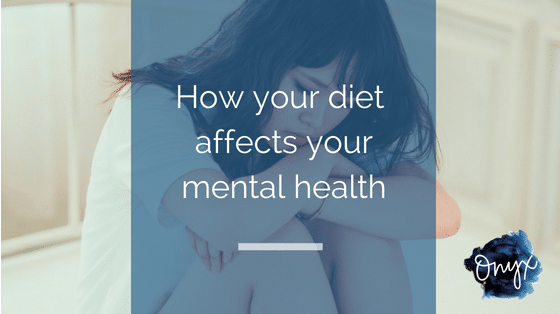 Depression is isolating and disruptive to your life, but luckily making changes to your diet, along with other interventions can help you regain control over your health. Cao, C., Pathak, S., & Patil, K. (Eds.). (2018). Antioxidant Nutraceuticals: Preventive and Healthcare Applications. CRC Press. Gangwisch, J. E., Hale, L., Garcia, L., Malaspina, D., Opler, M. G., Payne, M. E., … & Lane, D. (2015). High glycemic index diet as a risk factor for depression: analyses from the Women’s Health Initiative. The American journal of clinical nutrition, 102(2), 454-463. Kiecolt-Glaser, J. K., Fagundes, C. P., Andridge, R., Peng, J., Malarkey, W. B., Habash, D., & Belury, M. A. (2017). Depression, daily stressors and inflammatory responses to high-fat meals: when stress overrides healthier food choices. Molecular psychiatry, 22(3), 476. Stein, Dan J., Petrus J. Naudé, and Michael Berk. “Stress, Depression, and Inflammation: Molecular and Microglial Mechanisms.” Biological psychiatry 83.1 (2018): 5-6. Uribarri, J., Woodruff, S., Goodman, S., Cai, W., Chen, X., Pyzik, R., … & Vlassara, H. (2010). Advanced glycation end products in foods and a practical guide to their reduction in the diet. Journal of the American Dietetic Association, 110(6), 911-916. 6. WHO Depression Fact Sheet. http://www.who.int/mediacentre/factsheets/fs369/en/ Accessed April 18, 2018.